More Details Canada Goose Men's WindBridge Wool & Nylon Hoodie Jacket Details Canada Goose "WindBridge" hoodie. Features wind/water resistant hood and panels. Drawcord hood; zipper front. Long sleeves; left logo patch. Rib-knit cuffs and hem. Two side zip pockets. One interior pocket. Slim-fit silhouette. Hip-length hem. Merino wool. Nylon lining. Dry clean. Imported. Canada Goose Men's WindBridge Wool & Nylon Hoodie Jacket Details Canada Goose "WindBridge" hoodie. 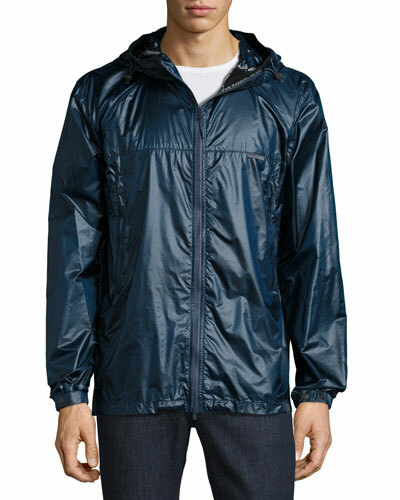 Features wind/water resistant hood and panels. Drawcord hood; zipper front. Long sleeves; left logo patch. Rib-knit cuffs and hem. Two side zip pockets. One interior pocket. Slim-fit silhouette. Hip-length hem. Merino wool. Nylon lining. Dry clean. Imported. 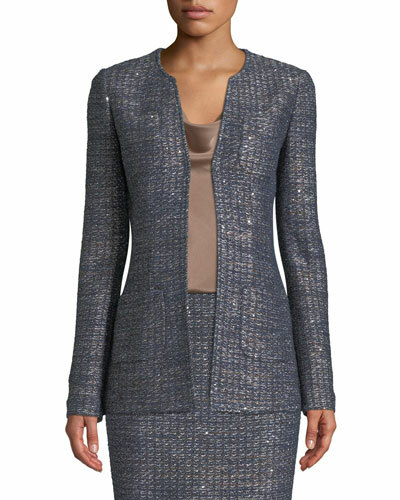 More Details St. John Collection Copper Sequin Tweed Knit Jacket Details St. John Collection jacket in copper-sequined metallic tweed knit. Split neckline; hook-and-eye front. Long sleeves. Front patch pockets. Long, slim fit. Rayon/polyester/cotton/nylon. Made in USA of imported material. St. John Collection Copper Sequin Tweed Knit Jacket Details St. John Collection jacket in copper-sequined metallic tweed knit. Split neckline; hook-and-eye front. Long sleeves. Front patch pockets. Long, slim fit. Rayon/polyester/cotton/nylon. Made in USA of imported material. 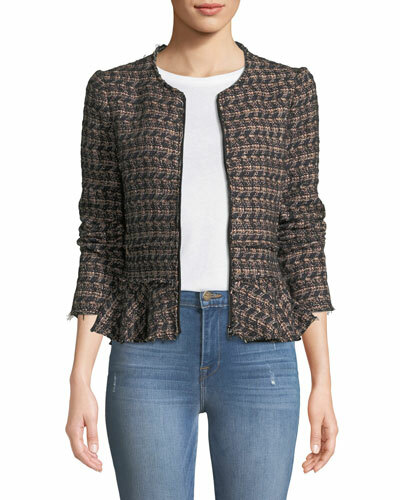 More Details Rebecca Taylor Zip-Front Tweed Peplum Jacket Details Rebecca Taylor tweed jacket. Crew neckline; front zip. Long sleeves. Slim silhouette. Peplum hem. Cotton/virgin wool/polyester/nylon. Silk combo; viscose/cotton lining. Imported. Rebecca Taylor Zip-Front Tweed Peplum Jacket Details Rebecca Taylor tweed jacket. Crew neckline; front zip. Long sleeves. Slim silhouette. Peplum hem. Cotton/virgin wool/polyester/nylon. Silk combo; viscose/cotton lining. Imported. More Details Anatomie Kenya 4-Pocket Safari Jacket Details Anatomie "Kenya" safari jacket. Lightweight with UV protection. Spread collar; snap/zip front. Slim fit. Nipped-in waist. Long sleeves; snap closure on cuffs. Fitted silhouette; nipped-in waist. Two zip pockets; two slash pockets. Two flap pockets. Hip-length hem. Nylon/spandex. Wash cold inside out. Imported. Anatomie Kenya 4-Pocket Safari Jacket Details Anatomie "Kenya" safari jacket. Lightweight with UV protection. Spread collar; snap/zip front. Slim fit. Nipped-in waist. Long sleeves; snap closure on cuffs. Fitted silhouette; nipped-in waist. Two zip pockets; two slash pockets. Two flap pockets. Hip-length hem. Nylon/spandex. Wash cold inside out. Imported. 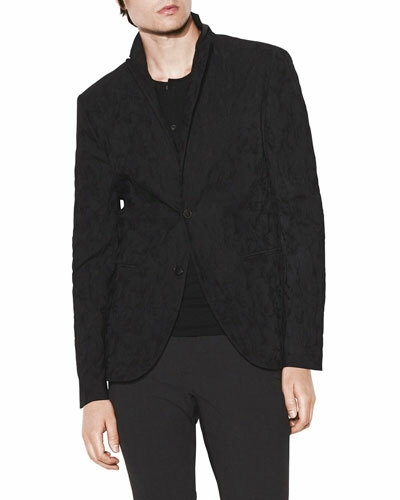 More Details Emporio Armani Notched-Lapel One-Button Optic-Print Wool-Blend Jacket Details Emporio Armani jacket in optic-printed wool-blend. Notched collar; one-button front. Long sleeves; button cuffs. Front welt pockets. Slim silhouette. Virgin wool/cotton/nylon/spandex. Imported. 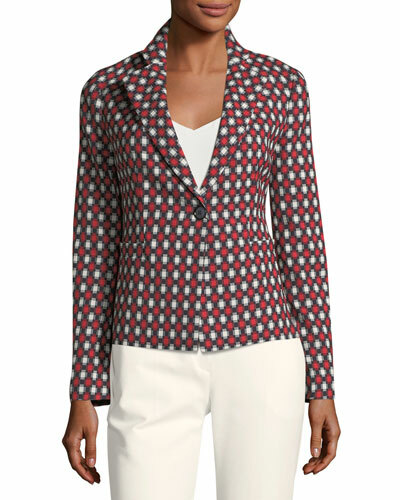 Emporio Armani Notched-Lapel One-Button Optic-Print Wool-Blend Jacket Details Emporio Armani jacket in optic-printed wool-blend. Notched collar; one-button front. Long sleeves; button cuffs. Front welt pockets. Slim silhouette. Virgin wool/cotton/nylon/spandex. Imported. 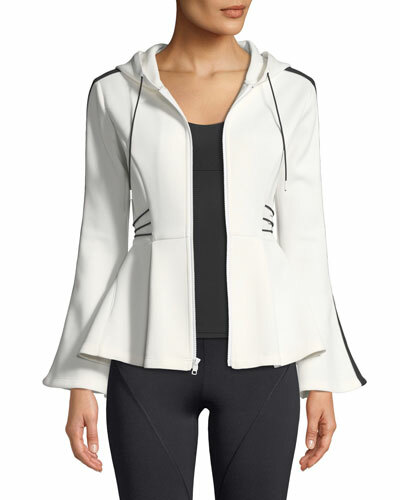 More Details CUSHNIE Hooded Flare-Sleeve Peplum Jacket with Contrast Cording Details CUSHNIE jacket with sporty contrast side-stripes. Drawstring hood; zip front. Long flared sleeves. Slim silhouette. Peplum hem. Contrast cording at sides. Rayon/nylon/spandex. Made in USA. 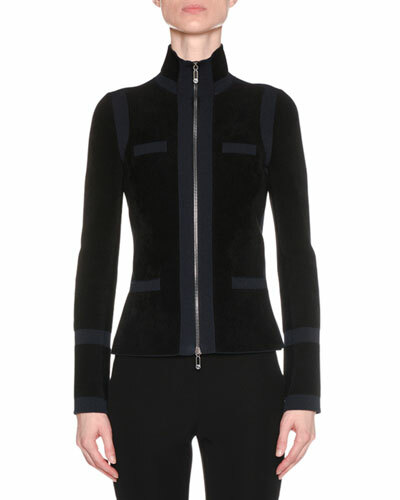 CUSHNIE Hooded Flare-Sleeve Peplum Jacket with Contrast Cording Details CUSHNIE jacket with sporty contrast side-stripes. Drawstring hood; zip front. Long flared sleeves. Slim silhouette. Peplum hem. Contrast cording at sides. Rayon/nylon/spandex. Made in USA. 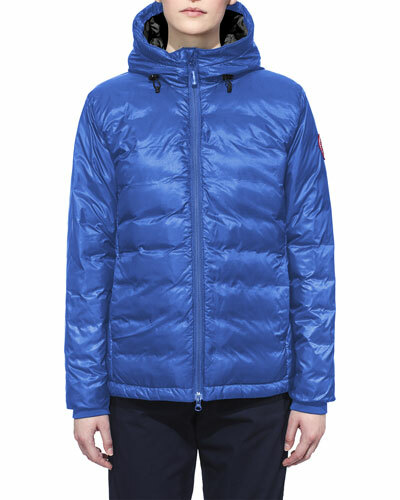 More Details Canada Goose Victoria Fur-Hood Parka Jacket Details Canada Goose Victoria parka with 675 fill power white duck down from the Outdoor Performance Collection. Removable natural coyote fur (Canada or USA) trimmed hood with fleece lining. Approx. 33"L from shoulder to hem. Interior shoulder straps to conveniently carry parka like a backpack. Long sleeves with logo patch left arm; rib-knit cuffs lock out the cold. Storm flap conceals two-way locking reversed coil zip front. Fleece-lined front zipper pockets; interior pockets. Slim, body-flattering silhouette with an interior drawstring cord. Vented back. Polyester/cotton; water-repellant nylon lining; fill: duck down. Dry clean. Made in Canada. Canada Goose Victoria Fur-Hood Parka Jacket Details Canada Goose Victoria parka with 675 fill power white duck down from the Outdoor Performance Collection. Removable natural coyote fur (Canada or USA) trimmed hood with fleece lining. Approx. 33"L from shoulder to hem. Interior shoulder straps to conveniently carry parka like a backpack. Long sleeves with logo patch left arm; rib-knit cuffs lock out the cold. Storm flap conceals two-way locking reversed coil zip front. Fleece-lined front zipper pockets; interior pockets. Slim, body-flattering silhouette with an interior drawstring cord. Vented back. Polyester/cotton; water-repellant nylon lining; fill: duck down. Dry clean. Made in Canada. More Details Lafayette 148 New York Darcy One-Button Stardust Wool Suiting Jacket Details Lafayette 148 New York "Darcy" jacket in stardust wool suiting. Slim shawl collar. One-button front. Long sleeves. Front, angled welt pockets. Tailored fit. 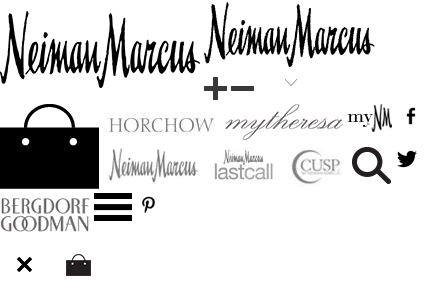 Wool/cashmere/polyester/nylon/spandex. Imported of Italian materials. Lafayette 148 New York Darcy One-Button Stardust Wool Suiting Jacket Details Lafayette 148 New York "Darcy" jacket in stardust wool suiting. Slim shawl collar. One-button front. Long sleeves. Front, angled welt pockets. Tailored fit. Wool/cashmere/polyester/nylon/spandex. Imported of Italian materials. 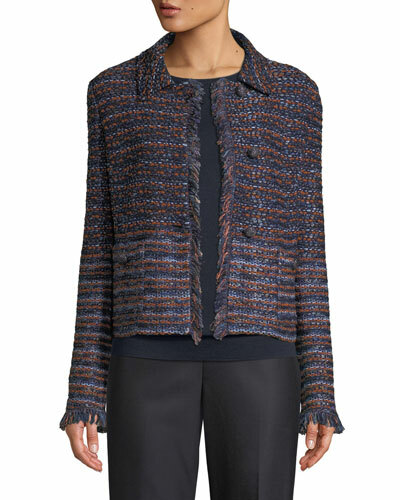 More Details Emporio Armani Zip-Front Plaid Mohair Jacket w/ Velvet Pockets Details Emporio Armani plaid mohair jacket. Crew neckline; two-way zip front. Long sleeves. Front velvet pockets. Slim silhouette. Wool/nylon/mohair wool/alpaca. Combo, polyester/silk. Imported. 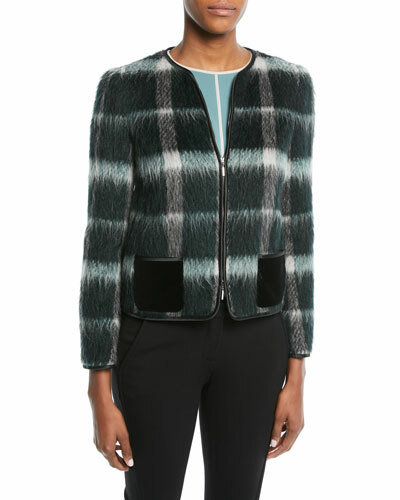 Emporio Armani Zip-Front Plaid Mohair Jacket w/ Velvet Pockets Details Emporio Armani plaid mohair jacket. Crew neckline; two-way zip front. Long sleeves. Front velvet pockets. Slim silhouette. Wool/nylon/mohair wool/alpaca. Combo, polyester/silk. Imported. More Details St. John Collection Ombre Ribbon Knit Jacket Details St. John Collection ombre ribbon knit jacket with fringe trim. Spread collar; button front. Long sleeves. Front pockets. Slim fit. Rayon/nylon/wool/cotton/polyester. Made in USA of imported material. St. John Collection Ombre Ribbon Knit Jacket Details St. John Collection ombre ribbon knit jacket with fringe trim. Spread collar; button front. Long sleeves. Front pockets. Slim fit. Rayon/nylon/wool/cotton/polyester. Made in USA of imported material. 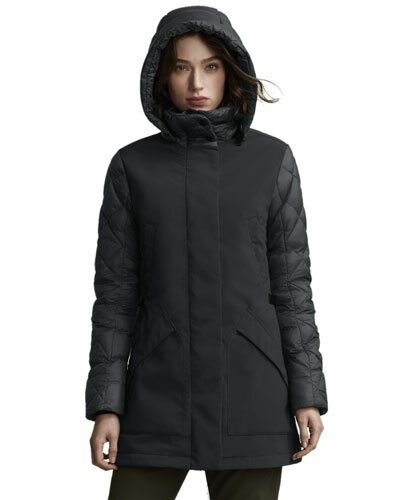 More Details Canada Goose Brookvale Quilted Hoodie Puffer Jacket Details "Brookvale" lightweight, breathable, portable hoodie by Canada Goose with 725 fill power Hutterite white duck down. Approx. 26"L down center back. TEI score of 2; comfortably endures temperatures of 0 to -15 degrees Celsius (32 to 5 degrees Fahrenheit.) Adjustable tunnel hood; two-way YKK® zipper with wind guard. Long sleeves with thumbhole cuffs; logo patch on left sleeve. Tricot-lining at the back of the neck for added warmth. Coat easily packs up into interior pocket. Slim, insulated fit. 90/10 white duck down. Nylon; recycled polyester lining. Machine wash. Made in Canada. 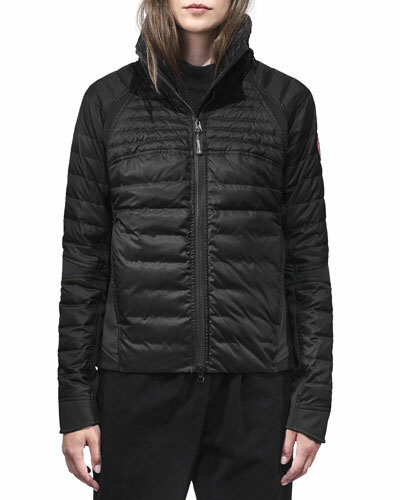 Canada Goose Brookvale Quilted Hoodie Puffer Jacket Details "Brookvale" lightweight, breathable, portable hoodie by Canada Goose with 725 fill power Hutterite white duck down. Approx. 26"L down center back. TEI score of 2; comfortably endures temperatures of 0 to -15 degrees Celsius (32 to 5 degrees Fahrenheit.) Adjustable tunnel hood; two-way YKK® zipper with wind guard. Long sleeves with thumbhole cuffs; logo patch on left sleeve. Tricot-lining at the back of the neck for added warmth. 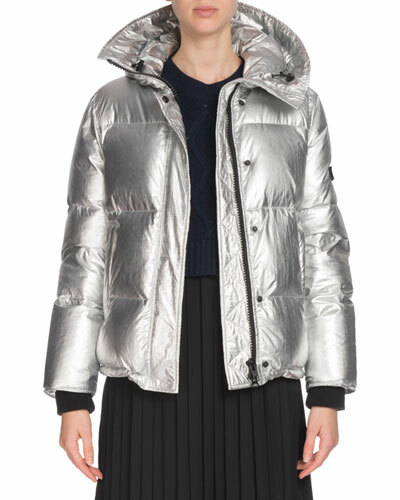 Coat easily packs up into interior pocket. Slim, insulated fit. 90/10 white duck down. Nylon; recycled polyester lining. Machine wash. Made in Canada. More Details Berek Foil Lace Blazer Details Berek blazer in frosted metallic lace. Approx. length: 24"L from shoulder to hem; 26.5"L down center back. Notched collar; jeweled two-button front. Long sleeves; shoulder pads. Top-entry flap pockets. Vented back. Slim fit. Nylon/cotton. Hand wash. Imported. Berek Foil Lace Blazer Details Berek blazer in frosted metallic lace. Approx. length: 24"L from shoulder to hem; 26.5"L down center back. Notched collar; jeweled two-button front. Long sleeves; shoulder pads. Top-entry flap pockets. Vented back. Slim fit. Nylon/cotton. Hand wash. Imported. More Details Canada Goose Brookvale Puffer Jacket Details Canada Goose "Brookvale" lightweight, quilted puffer jacket with 750 fill power white duck down. Approx. 28.8"L down center back. Self-packable into interior pocket for travel-friendly pillow. Funnel neckline with brushed tricot chin guard and back-collar. Heavy duty YKK® two-way full-zip front. Insulated wind guard behind front zipper. Fleece-lined hand-warmer pockets. Hip length. Slim fit. Shell, nylon; lining, recycled polyester. Made in Canada. Canada Goose Brookvale Puffer Jacket Details Canada Goose "Brookvale" lightweight, quilted puffer jacket with 750 fill power white duck down. Approx. 28.8"L down center back. Self-packable into interior pocket for travel-friendly pillow. Funnel neckline with brushed tricot chin guard and back-collar. Heavy duty YKK® two-way full-zip front. Insulated wind guard behind front zipper. Fleece-lined hand-warmer pockets. Hip length. Slim fit. Shell, nylon; lining, recycled polyester. Made in Canada. More Details Belstaff Halewood Down Biker Jacket Details Belstaff "Halewood" café racer biker-style jacket in water-resistant tech. 91/9 duck down/feather fill. Stand collar with snap tab; zip front. Long sleeves; logo patch at left. Front zip pockets. Slim fit. Self and sleeve lining, nylon. Dry clean. Imported. Belstaff Halewood Down Biker Jacket Details Belstaff "Halewood" café racer biker-style jacket in water-resistant tech. 91/9 duck down/feather fill. Stand collar with snap tab; zip front. Long sleeves; logo patch at left. Front zip pockets. Slim fit. Self and sleeve lining, nylon. Dry clean. Imported. 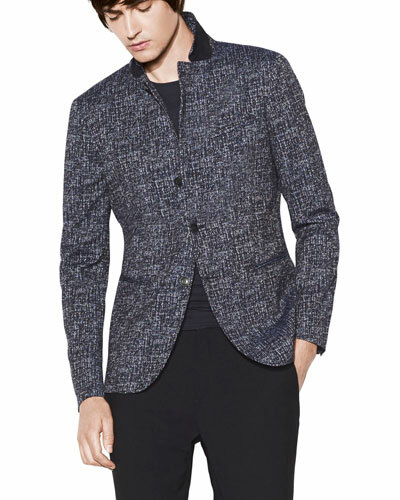 More Details Ralph Lauren Collection The Tweed Jacket, Black/White Details Slimmed-down straight fit. Approx. 30.5" front body length; 29.5" back body length; 33" sleeve length (Size 8). Wide notch lapels; contrasting undercollar; buttoned throat latch at the left collar; two-button silhouette; genuine horn buttons. 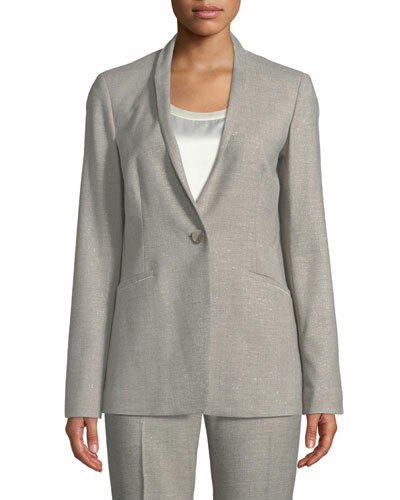 Long sleeves with four-button cuffs; shoulder pads; suede elbow patches; left chest welt pocket; two front waist flapped pockets; darts at the front. Vented back hem; silk-lined sleeves and back yoke. 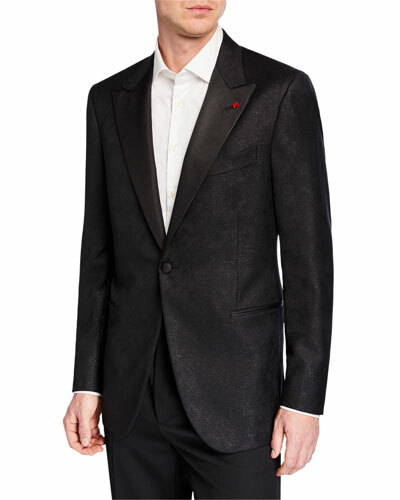 Shell: wool/nylon; undercollar: wool; elbow patches: lambskin; lining: silk. Dry clean by a leather specialist. Made in the USA of imported materials. 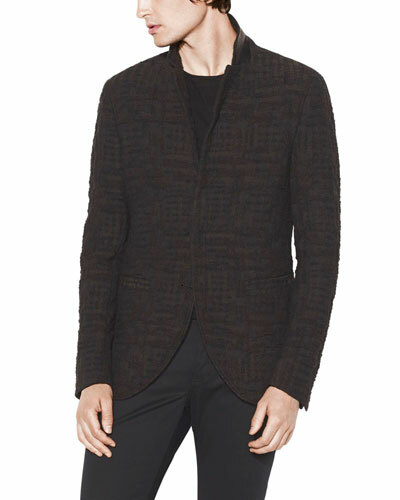 Ralph Lauren Collection The Tweed Jacket, Black/White Details Slimmed-down straight fit. Approx. 30.5" front body length; 29.5" back body length; 33" sleeve length (Size 8). Wide notch lapels; contrasting undercollar; buttoned throat latch at the left collar; two-button silhouette; genuine horn buttons. 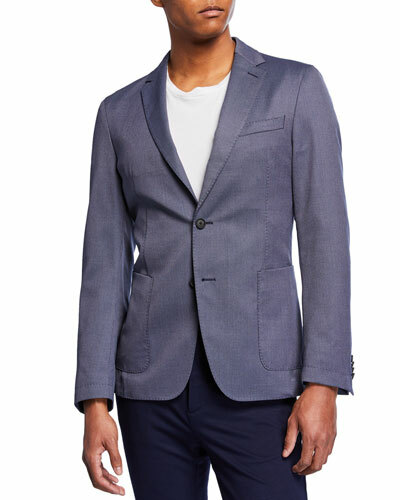 Long sleeves with four-button cuffs; shoulder pads; suede elbow patches; left chest welt pocket; two front waist flapped pockets; darts at the front. Vented back hem; silk-lined sleeves and back yoke. 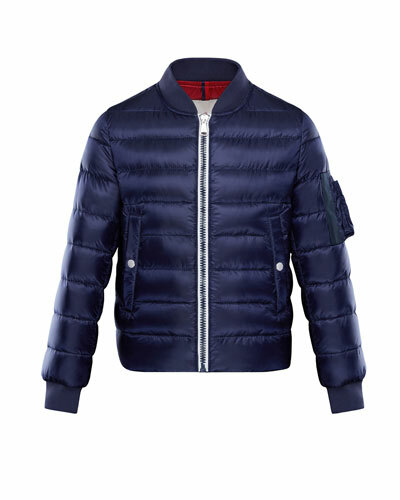 Shell: wool/nylon; undercollar: wool; elbow patches: lambskin; lining: silk. Dry clean by a leather specialist. Made in the USA of imported materials. More Details Canada Goose Brace Bridge Zip-Front Jacket Details Canada Goose "Brace Bridge" jacket. Approx. 25.2"L center back to hem. Stand collar; two-way zip front. Long sleeves; logo patch at left arm. Slim silhouette. Straight hem. Polyester/nylon. Made in Canada of domestic material. Canada Goose Brace Bridge Zip-Front Jacket Details Canada Goose "Brace Bridge" jacket. Approx. 25.2"L center back to hem. Stand collar; two-way zip front. Long sleeves; logo patch at left arm. Slim silhouette. Straight hem. Polyester/nylon. Made in Canada of domestic material. 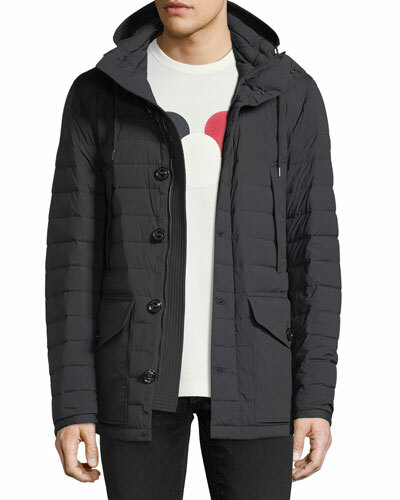 More Details Moncler Cigales Hooded Jacket Details Moncler "Cigales" quilted jacket. Hooded neckline; stand collar. Button-placket hidden zip front. Long sleeves. Side slip pockets. Flap patch pockets at hips. Slim fit. Straight hem. Nylon/spandex leather trim. Made in Romania. Please note: Moncler runs small. We suggest that you order a size larger than you typically wear. Moncler Cigales Hooded Jacket Details Moncler "Cigales" quilted jacket. Hooded neckline; stand collar. Button-placket hidden zip front. Long sleeves. Side slip pockets. Flap patch pockets at hips. Slim fit. Straight hem. Nylon/spandex leather trim. Made in Romania. Please note: Moncler runs small. We suggest that you order a size larger than you typically wear. More Details Canada Goose Sandpoint Wind-Resistant Jacket Details Canada Goose "Sandpoint" jacket in Solo Light ultra-lightweight tech fabric with wind- and water-resistant finish. Approx. 29.8"L down center back (size L). Non-removable, adjustable snorkel hood with a shaped brim; two-way zip front. Long sleeves; elasticized cuffs with snaps. Utility side zip pockets. Back zip-welt pocket. Drawstring hem. Hip length. Slim fit. Nylon. Made in Canada of domestic and imported material. Canada Goose Sandpoint Wind-Resistant Jacket Details Canada Goose "Sandpoint" jacket in Solo Light ultra-lightweight tech fabric with wind- and water-resistant finish. Approx. 29.8"L down center back (size L). Non-removable, adjustable snorkel hood with a shaped brim; two-way zip front. Long sleeves; elasticized cuffs with snaps. Utility side zip pockets. Back zip-welt pocket. Drawstring hem. Hip length. Slim fit. Nylon. Made in Canada of domestic and imported material. More Details Canada Goose Hybridge Perren Jacket Details Canada Goose "Hybridge Perren" jacket in laminated, water-resistant 3-layer soft shell fabric. 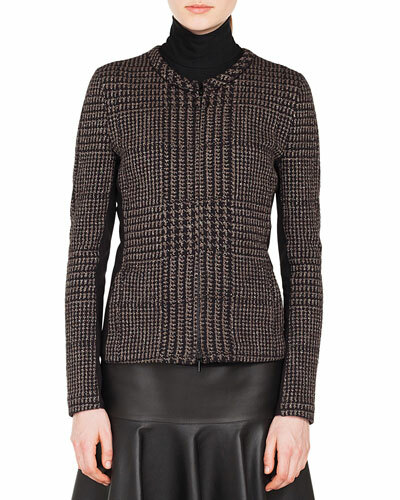 Tensile-knit fabric at elbow, underarm, and hem panel for ease of movement and added comfort. 800 fill power Hutterite white goose down. 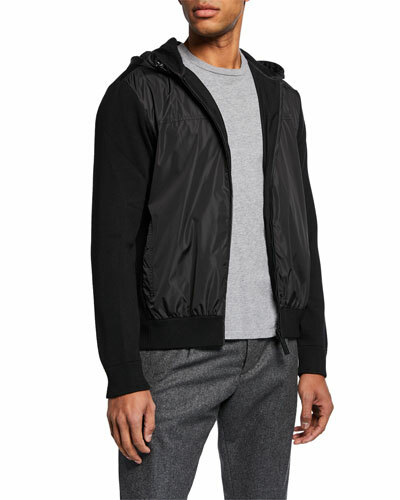 Hooded collar; two-way zip front. Long sleeves; logo patch on left sleeve. Fleece-lined exterior pocket and one interior mesh pocket. Slim, insulated fit. Shell 1, nylon; shell 2, nylon/polyurethane. Machine wash. Made in Canada. 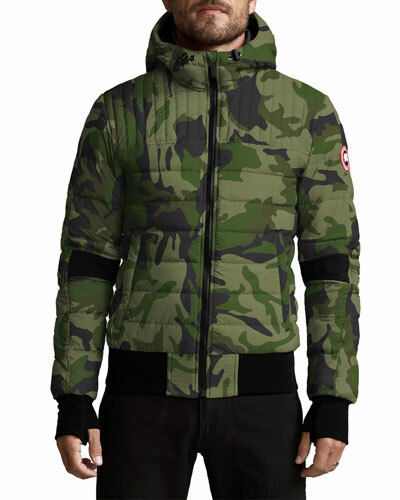 Canada Goose Hybridge Perren Jacket Details Canada Goose "Hybridge Perren" jacket in laminated, water-resistant 3-layer soft shell fabric. 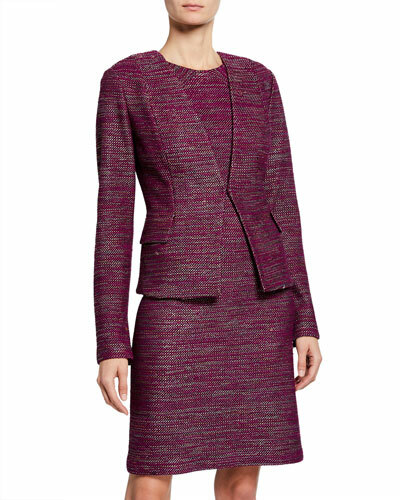 Tensile-knit fabric at elbow, underarm, and hem panel for ease of movement and added comfort. 800 fill power Hutterite white goose down. Hooded collar; two-way zip front. Long sleeves; logo patch on left sleeve. Fleece-lined exterior pocket and one interior mesh pocket. Slim, insulated fit. Shell 1, nylon; shell 2, nylon/polyurethane. Machine wash. Made in Canada. More Details Berek Petite Foil Lace Blazer Details Berek blazer in frosted metallic lace. Approx. length: 24"L from shoulder to hem; 26.5"L down center back. Notched collar; jeweled two-button front. Long sleeves; shoulder pads. Top-entry flap pockets. Vented back. Slim fit. Nylon/cotton. Hand wash. Imported. Berek Petite Foil Lace Blazer Details Berek blazer in frosted metallic lace. Approx. length: 24"L from shoulder to hem; 26.5"L down center back. Notched collar; jeweled two-button front. Long sleeves; shoulder pads. Top-entry flap pockets. Vented back. Slim fit. Nylon/cotton. Hand wash. Imported. 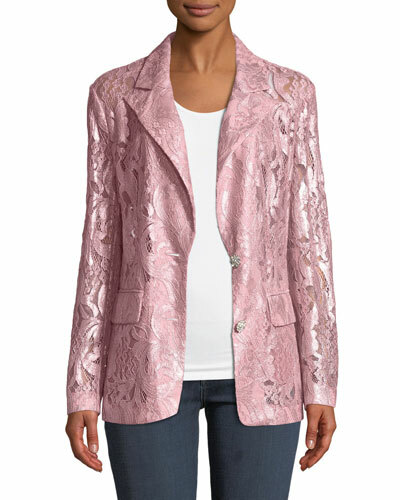 More Details Berek Plus Size Foil Lace Blazer Details Berek blazer in frosted metallic lace. Approx. length: 24"L from shoulder to hem; 26.5"L down center back. Notched collar; jeweled two-button front. Long sleeves; shoulder pads. Top-entry flap pockets. Vented back. Slim fit. Nylon/cotton. Hand wash. Imported. Berek Plus Size Foil Lace Blazer Details Berek blazer in frosted metallic lace. Approx. length: 24"L from shoulder to hem; 26.5"L down center back. Notched collar; jeweled two-button front. Long sleeves; shoulder pads. Top-entry flap pockets. Vented back. Slim fit. Nylon/cotton. Hand wash. Imported. 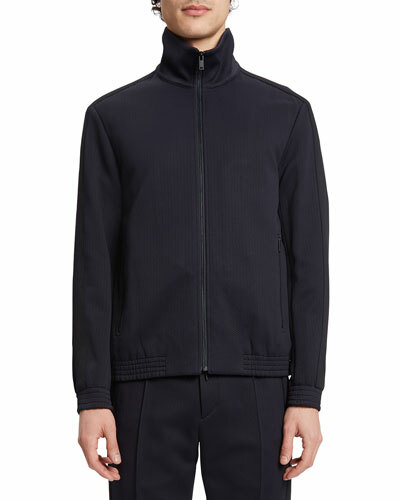 More Details Loro Piana Windmate Reversible Bomber Jacket Details Loro Piana "Windmate" bomber jacket reverses from wind-resistant nylon to wool. Stand collar; two-way zip front. Long sleeves. Angled zip pockets. Relaxed slim fit. Made in Italy. Loro Piana Windmate Reversible Bomber Jacket Details Loro Piana "Windmate" bomber jacket reverses from wind-resistant nylon to wool. Stand collar; two-way zip front. Long sleeves. Angled zip pockets. Relaxed slim fit. Made in Italy. 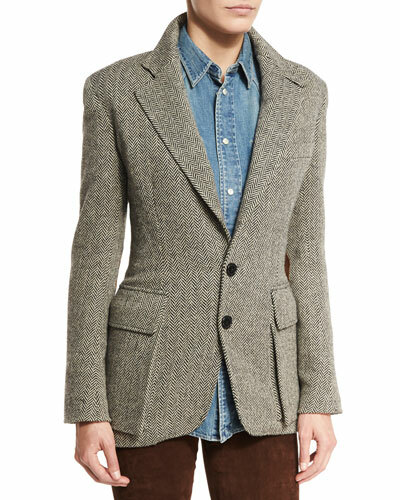 More Details THE ROW New Schoolboy Two-Button Blazer Details The Row "New Schoolboy" wool-blend blazer. Notched lapels; two-button front. Three-quarter sleeves. Welt pocket at left chest. Two welt pockets at hips. Slim silhouette. Straight hem. Virgin wool/nylon/elastic. Made in USA of Italian materials. 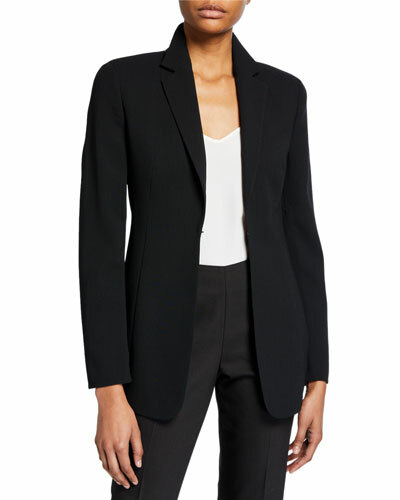 THE ROW New Schoolboy Two-Button Blazer Details The Row "New Schoolboy" wool-blend blazer. Notched lapels; two-button front. Three-quarter sleeves. Welt pocket at left chest. Two welt pockets at hips. Slim silhouette. Straight hem. Virgin wool/nylon/elastic. Made in USA of Italian materials. 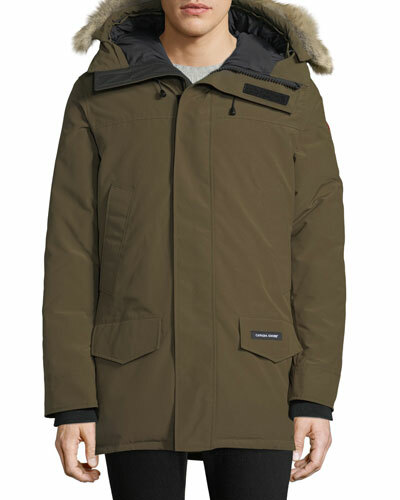 More Details Canada Goose Men's Wyndham Fusion-Fit Down Parka with Fur-Trim Hood Details Canada Goose "Wyndham" down-filled parka with removable natural coyote fur (Canada/USA) trim. Fit: Slim. Approx. 30"L down center back. Funnel neckline with hood; front zip with snap-over storm flap. Button straps at cuffs; logo patch at left sleeve. Front flap-snap pockets at hips. Long-line hem reaches thighs. Fusion fit. Polyester/cotton; lining, nylon. White duck down fill. Imported. 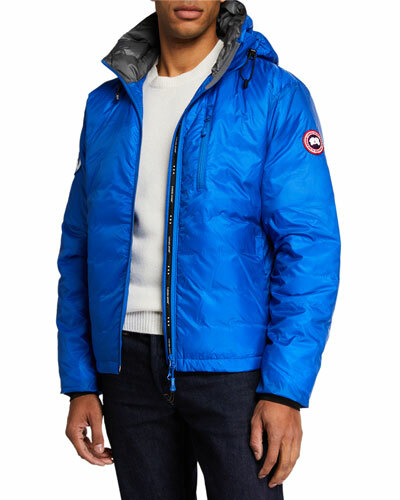 Canada Goose Men's Wyndham Fusion-Fit Down Parka with Fur-Trim Hood Details Canada Goose "Wyndham" down-filled parka with removable natural coyote fur (Canada/USA) trim. Fit: Slim. Approx. 30"L down center back. Funnel neckline with hood; front zip with snap-over storm flap. Button straps at cuffs; logo patch at left sleeve. Front flap-snap pockets at hips. Long-line hem reaches thighs. Fusion fit. Polyester/cotton; lining, nylon. White duck down fill. Imported.